Providing interoperability between Ably and other realtime, streaming & queueing protocols. The Ably platform ensures interoperability between clients using our native Ably realtime protocol, and clients using other realtime, streaming or queueing protocols. Choose the right protocol for the job, and migrate to Ably with ease. We've taken an existing game of Pong and created five instances of it, each using a different realtime backend, Ably, Pusher over Ably, PubNub over Ably, Pusher direct and PubNub direct. Judge for yourself how well the adapters work. A blog post, from Ably's chairman, looking at how realtime experiences are part of the next wave of digital customer experiences, and why Ably Protocol Adapters are going to help our customers deliver these experiences on any device. We currently support Ably's realtime and REST protocols, as well as MQTT, and Pusher and PubNub realtime protocols. 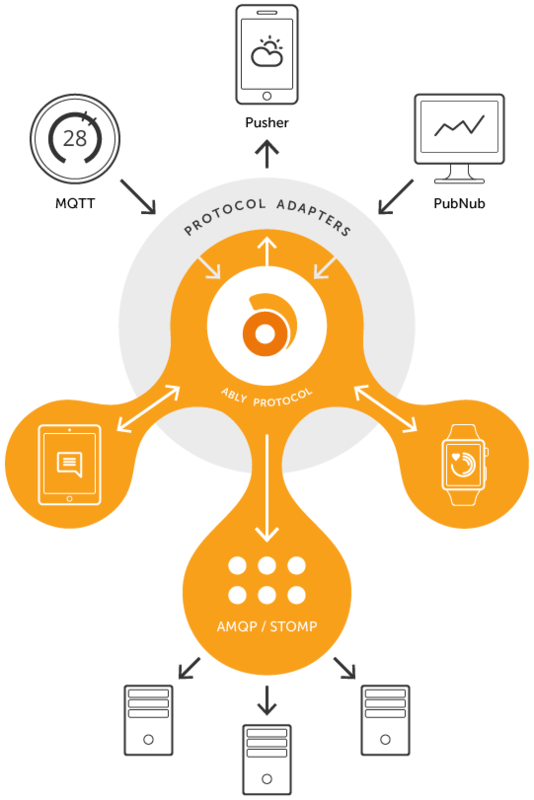 Additionally we support two queueing protocols, AMQP and STOMP. Consuming, processing and reacting to realtime data on your servers is not easy, especially if you consume data using the pub/sub pattern. Ably's Reactor service solves that problem by allowing you to consume data using traditional queueing protocols, stream data to your servers, or trigger code in real time as messages or events are published. MQTT provides a lightweight messaging protocol for small sensors and mobile devices, optimized for low-bandwidth or unreliable networks. MQTT libraries already exist for almost every IoT device around. With Ably, you can benefit from the reach, redundancy and performance of our platform without having to to integrate our client libraries built on our native realtime protocol. We don't believe our customers should be locked in, we prefer happy customers how want to stay. Using our adapters, customers have migrates over to Ably with only a few small configuration changes. Configuration changes can be done in minutes and Ably does the rest, it's nothing short of magic! With our honest pay for what you use pricing, higher quality of service, broader reach and great client libraries and developer support, we can't think of any reason not to join the others and migrate to Ably. Our Pusher protocol adapter ensures you can migrate to Ably without having to change any code, thus reducing the cost and risk of moving over. Our PubNub protocol adapter ensures you can migrate to Ably without having to change any code, thus reducing the cost and risk of moving over. Ably provides reliable ordering, connection state recovery, and a 100% uptime guarantee meaning you can rely on us to deliver your realtime data. From presence and history for your clients, to queues and WebHooks for your servers, we provide the features you need. Transparent usage based pricing - pay for what you use instead of arbitrary pricing tiers.